Experiencing the Lives of Bulacan Fisherfolk: Courage Transforms Fujitsu’s Eco-Warriors to Plant 1,200 Mangroves | FEED, Inc.
15 July 2017, Mangrove Eco-Park, Taliptip, Bulacan. 37 zealous eco-warriors of Fujitsu Ten Solutions Philippines, Inc. sponsored the planting of 1,200 mangrove propagules at the Mangrove Eco-Park in the town of Taliptip in Bulacan, Philippines – as a part of their corporate and personal environmental advocacies. The passionate group raised funds amongst themselves from within the company’s Environmental Management Systems (EMS) division, the amount of which was then topped up by Fujitsu corporate to demonstrate their continued commitment to the group’s regular Corporate Social Responsibility (CSR) program of activities. Given that this planting is Fujitsu’s second with FEED (the first was held last November 2016, see: “One Touch of Nature Makes the Whole World Kin” – Tree Planting Photo Journey of Fujitsu Eco-Warriors), another 1,800 propagules was committed by FEED to bring the total to 3,000 indigenous Philippine mangrove trees that will help protect Bulacan’s coastal communities from rising tides; the remaining 1,800 propagules will be planted by the local Taliptip community managing the as a part of their livelihood development program, also a fundamental requirement in FEED’s planting methodology. The program was designed to be authentic, to enable participants to experience the lives of the Bulacan fisherfolk who have had to adapt to climate change in a very drastic way: from mainly rice farming 20 years ago, to fish farming today, facing rising floodwaters and the harsh challenges that accompany the Habagat (southwest monsoon, Jun-Sep) and Amihan (northeast monsoon, around Nov-Feb). The experience was comparable to the inner workings of a mangrove, growing up. Mangroves must extract freshwater from the seawater that surrounds them. Many mangrove species survive by filtering out as much as 90 percent of the salt found in seawater as it enters their roots. Despite the rising tide at the time of planting, wading and struggling through the knee deep “putik” or mud, scraping feet, toes and legs against broken sea shells and thorns, rain and limited visibility through the waters of Bulacan’s coastline – the courageous Fujitsu tree planters braved the knee deep mud and waist high waters to plant their Living Legacies – the very same way Bulaceño fisherfolk do on a regular basis. “I am writing on behalf of One Child, One Tree Project and Fostering Education & Environment for Development, Inc. (FEED, Inc., for which I am an ambassador) to express our sincere appreciation for the donation of P4,500. One Child, One Tree is an environmental project that I founded in January 2017. I am privileged to be working with 30 volunteers. Our first project was planting 1000 trees in 25 schools and training 4,000 students on environment protection. From that project, we identified the need to grow and nurture mangroves along our shoreline and mangrove forests. Your donation will be used to purchase Aviccenia mangrove that will be planted in the Tibaguin Mangrove Nursery. The nursery is one of the four phases of the Mangrove Reforestation Project which includes research on mangrove species, environment education, and out-planting. 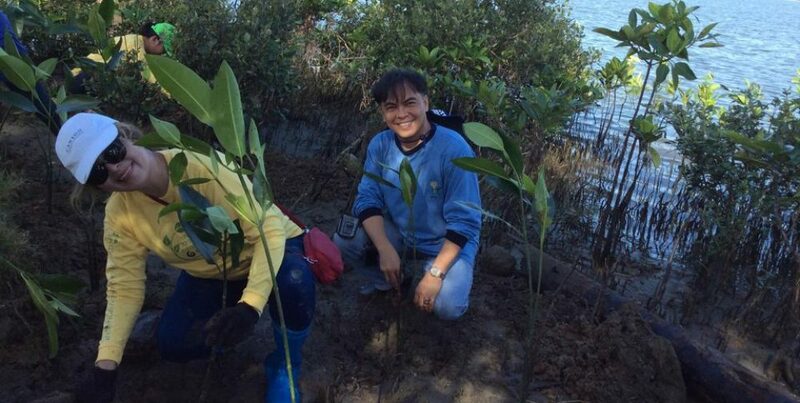 In the next few years, we aim to plant 50,000 mangroves along the shoreline of Hagonoy, Bulacan. The nursery has been started on 15th July with the participation of OCOT volunteers and community folks, and with funding from the governor of Bulacan. It is aimed at nurturing young mangrove seedlings until they are ready to be planted in the forests/shoreline. In addition, it will also provide livelihood to community residents. Click here for the full letter: Letter for Fujitsu Ten Phils Inc., July 2017. A study published early July 2017 in the journal Science shows, climate change is driving a universal major redistribution of life on Earth. These changes in the distribution of vegetation are also affecting the culture of Indigenous Arctic communities. The northward growth of shrubs is leading to declines in the low-lying mosses and lichens eaten by caribou and reindeer. The opportunities for Indigenous reindeer herding and hunting are greatly reduced, with economic and cultural implications…. Internationally, the impacts of species on the move will affect our capacity to achieve virtually all of the United Nations Sustainable Development Goals, including good health, poverty reduction, economic growth, and gender equity. Currently, these goals do not yet adequately consider effects of climate-driven changes in species distributions. This needs to change if we are to have any chance of achieving them in the future. About Fujitsu Ten Solutions Philippines, Inc.
Fujitsu Ten Solutions Philippines, Inc. (FTSPI) was established in 1999 by Fujitsu Ten Limited (FTL) and Fujitsu Ten Corporation of the Philippines (FTCP). Formerly called Fujitsu Ten Software Philippines, Inc., FTSPI develops software for state of the art technology in Car Audio Visual and Communication Equipment, Car Multimedia, Car Electronics and Simulation devices. It also carries out research and design of prototype units, electrical circuits, mechanical parts, printed circuit boards for car audio-visual equipments, car accessories and car electronic parts. Together with FTL and FTCP, FTSPI has since evoked Innovation, Speed and Quality in fulfilling its mission to develop software and hardware that integrate various media and applications to provide entertainment in cars, to ensure safety and efficiency in automotive electronics, to explore innovative ideas for information technology, and to pursue a clean environment. At FTSPI, we strive to provide pleasurable commuting by continuously developing car audio and visual facilities to keep up with evolving technology and customer’s needs. Prototypes for next-generation car electronics are developed by our talented professionals to provide a one-stop-shop for car navigation and entertainment. For more information on mangrove plantings or other Corporate Social Responsibility (CSR)Corporate Social Responsibility (CSR) events, contact FEED at info@feed.org.ph or call/text +63 (0)917 552 4722.